I’ve just got back from a research trip to Sydney. I don’t know greater Sydney terribly well, because when I visit, I spend most of my time in a library or the archives – or back in my hotel bedroom, filing notes or vegged out in front of old episodes of the Antiques Roadshow. This may not sound appealing to many people, but to me, a week in the Mitchell Library is sheer bliss. This time I blew the budget and stayed on the edge of the CBD, so I could walk to and from the library every day. There’s great charm in walking through a city, getting a feel for the layout and the geography, a sense of what the place felt like before the Car. 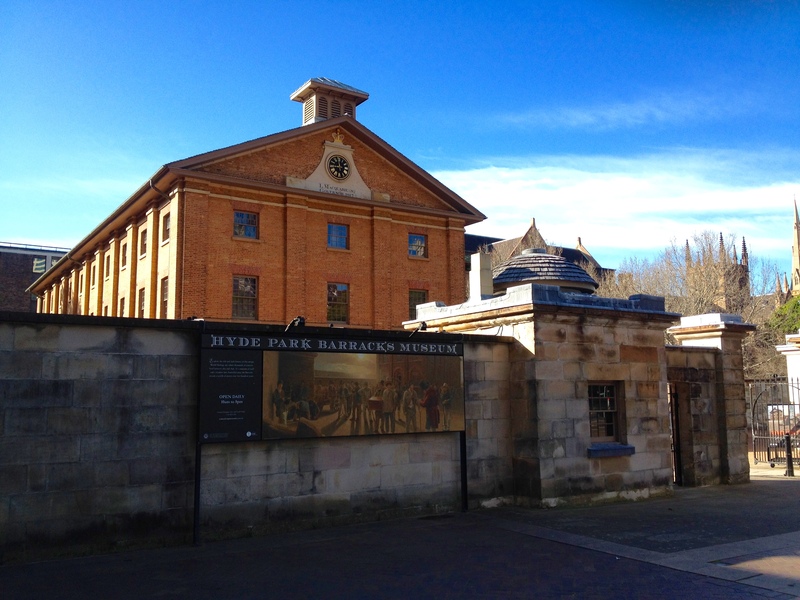 It is useful to pace out distances: how long did it take the New South Wales Corps to march from their barracks to Government House to overthrow Governor Bligh? I stayed in a hotel at the Chinatown end of Kent St. This isn’t the Rocks, the original rookery attached to the working port around the Harbour, so eloquently described by Grace Karskens in her book The Rocks but the other end of the CBD, the more orderly development that gradually replaced the original shacks and houses of the early colony. A symbol of that change is the Judge’s House in Kent St, the oldest house in the Sydney CBD, according to a plaque at the gate, and the second oldest building in Sydney, named after one of its first owners, Judge James Dowling. Though I’m not sure she ever lived there, the house reminded me of his wife Harriott, whose Memoir I read during the week. Kent St is named after the Duke of Kent, and nearby are memories of the other reprobate Hanoverian brothers, Sussex, Clarence and York. My walk took me past the Judge’s House into Bathurst St, named for the long-standing Secretary of State for the Colonies, Lord Bathurst, then across George St. This was the original High St of Sydney, and it is still one of its main commercial hubs. Named – naturally – for the King. Then up the slope of Bathurst St, crossing (Prime Ministers) Pitt and Castlereagh into Elizabeth St.
With Elizabeth St, I finally reach a street named after someone who actually visited the country – Elizabeth Macquarie, the Governor’s wife. Then across Hyde Park and across to Macquarie St.
Macquarie St, to my mind, is one of the loveliest streets in Sydney, with its sober Georgians, the Hyde Park Barracks and St James Church facing each other across the street. Beyond the barracks is the old Rum Hospital, now Parliament House. 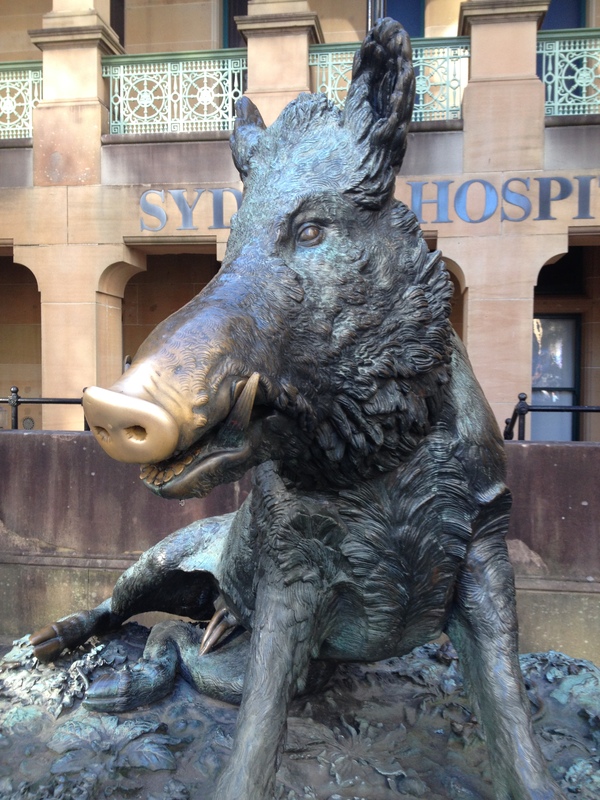 A pause to rub the pig’s nose – which I’ve been doing religiously since I first worked at the State Library of New South Wales in the 1970s – and I’m at the entrance as the doors open at 9. It was not to be, at least in Sydney. It all depends on the timing. In Brisbane, where the streets were laid out in the 1840s, the political order was reversed. One of the few things most people know about Brisbane is that its CBD is laid out on a grid where ‘the boys’ – Edward, Albert, George, William – go in one direction while ‘the girls’ – Ann, Adelaide, Queen, Elizabeth, Charlotte, Mary, Alice – go in the other. They are all Royal names until you reach the edge of town, where a few geographical features – Creek, Wharf – get a look in. On the south side of the river there is also a modified grid, though its features have been much broken up by later developments. There’s an imperial naming pattern at work here too, though not such an obvious one: the streets are named after Sir Robert Peel, Lord Melbourne, Lord John Russell and Lord Grey, all Prime Ministers, as well as Colonial Secretaries Barons Glenelg and Stanley, and Herman Merivale, the permanent under-secretary at the Colonial Office. Further afield is Gladstone Rd. Sydney Smith would be pleased. Most of these politicians and bureaucrats were Whigs, although party loyalties were shifting during the 1840s, and the old aristocratic term ‘Whig’ had been replaced by Liberal by the time that Mr. Gladstone became Prime Minister. The former Premier Peter Beattie once lamented that the name ‘Grey St’ was so bland and boring. In fact Earl Grey was not particularly boring, so it’s a shame that he is best known today for the tea that bears his name. It would be nice if, one day, all these street names carried brief biographies of the people – okay, men – that gave them their names. Otherwise a layer of history disappears into anonymity. Five years ago, I was invited to Newcastle, north of Sydney, to give a presentation on the history of coal mining in Australia to a group of fund managers. This is not my normal type of gig, but I once wrote a chapter on the topic as part of an interdisciplinary study of the coal industry in Australia. Australia’s coal industry first began in Newcastle, and it still depends on mining. It was a brief insight into how the other half (or, more likely, the top 10 percent) live. These fund managers were mainly American, and they had just come through the global financial crisis. These men had been badly burnt – but only metaphorically. Thumbs permanently attached to their Blackberries and groggy with jet lag, they were there to be schmoozed within an inch of their lives. Over the course of a long weekend, they moved from business breakfasts to a visit to port facilities to more presentations and a visit to a mine, interspersed with dinners at the ritziest restaurants Newcastle has to offer. It was all washed down with the best Hunter wines. At a waterfront seafood restaurant, I ordered salt and pepper squid from the 3 entrees on our special custom menu. This dish can often taste like greasy rubber bands, but here I expected it to be absolutely delicious, and it was. This was some compensation for a boring night, since none of the men (they were virtually all men) around me felt the least need to talk to me. In their normal lives, they probably outsourced small talk to their wives anyway. Through either luck or good management (your call will depend on your political allegiance) Australia came through the global financial crisis of 2007-9 relatively unscathed, which is why, not doubt, we cheerfully abbreviate it to the GFC. We did much better than America, so these fund managers were surprised by the strength of the Australian economy, the low unemployment, and the fact that Newcastle’s coal industry was touting for their business, promising profits well above what they could make at home. Two countries, on different phases of the investment cycle. I flew home next day, so I don’t know what happened to these optimistic plans. Five years later, the American economy is recovering but in Australia, coal and iron ore prices are cactus. Green shoots are very thin on the ground – especially in Newcastle, where the boom turned out to have a rotten core of political corruption too, and the uncontrolled growth of coalmines has killed much of the greenery anyway. The image of the vampire squid went viral, and I confess that it was a comfort to me to think of this as I sat there ignored, out of place surrounded by young men in suits twiddling under the table with their Blackberries. I was ignored until my meal arrived. I had been surprised by how few people ordered the salt and pepper squid. Clearly, when they saw my dish, some of my neighbours regretted not doing so – but it was ‘Mr Goldman Sachs’ who said, with amazement: ‘But it’s calamari!’ It turns out he didn’t even know what squid was. Two nations, divided by a single language.